It takes a horse with a special temperament to be suited to RDA, it doesn't suit all horses and ponies. We are fortunate to own, have on loan and borrow a range of horses and ponies of different types and skills, which enables the group to be able to offer riding and driving, to all ages and abilities. Danny is a 15hh piebald cob, who the Lincolnshire Wolds RDA group bought in 2012. Danny works hard for the group, as he is used for both riding and driving. He is a soft soul who enjoys his work. He likes to be pampered and willingly stands for hours to be groomed. He is very patient with participants and he understands his job well. He is very good at gauging the ability of the rider or driver and will adapt his responses accordingly. He makes an ideal RDA pony as he can alter the challenge to each person but without being strong or difficult. Quiet and steady with nervous, unbalanced riders but also can be forward going and willing with some of our experienced drivers. He is very gentle, though being a strong well-built cob, enables many riders to take up the opportunity of riding. Helton Bracken VII is a registered Fell pony, known by the name of Cracker. He is 13.2hh and 20 years old and has over his lifetime has given hours of enjoyment to both able and disabled riders - he has been helping us as an RDA pony for over 10 years. He works with both our riders and drivers, often pulling the wheelchair adapted carriage. He is very reliable and versatile, enabling drivers in wheelchairs, to access the countryside. A well known pony locally, many people know Cracker from either his current RDA role or as a pony club pony. Having been there, done that and got many tee-shirts, Cracker makes an ideal pony for us. During riding sessions he can often be found helping our smallest riders learn the basics and providing therapy wearing his adapted sheepskin. He is another pony who can adapt his way of going depending on his rider, often offering a new challenge to our more experienced riders. As a driving pony, Cracker is very willing and when asked can motor between the shafts! He enjoys driving round our tracks as well was working in the arena. He is a firm favorite with all our teams. Cracker loves kisses and when in his stable is normally checking out what is going on a LRAC. 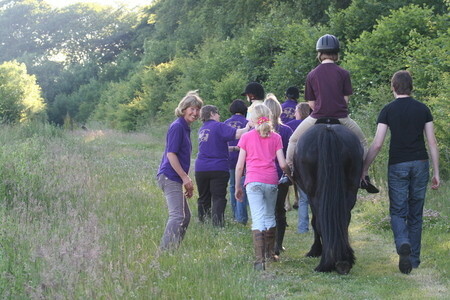 Being quiet on the ground means all our participants can work with him, grooming and handling. He has a ovable nature and often a butter wouldn't melt in his mouth outlook ....just after he has done something cheeky! Cracker is on loan to our group from the Canter family, to whom we are extremely grateful. Macaulay is a bay gelding who works with both riders and drivers. Macaulay is known for his calm and friendly disposition. He is used in both riding and driving sessions, often being used for our more nervous participants. In his previous life Macaulay used to give carriage rides on a local seafront before moving to LRAC to help educate young people about horses. In 2017 Macaulay was gifted to Lincolnshire Wolds RDA where he continues to help our group. Often found fast asleep in his stable snoring, Macaulay loves people and will happily be groomed for hours. He is very gentle with even the smallest rider and enjoys his carriage driving around the tracks. Harry is a welsh section D chestnut gelding who along with Macaulay officially joined Lincolnshire Wolds RDA in 2017. Harry works purely in the riding side of our group and loves having fun with both our novice riders and those who are more experienced. He is forward going with a cheeky personality, always happy to say hello to everyone and when ridden looks after his rider with care. Harry loves food and will check to see if anything you might have is edible. He grows an awesome moustache every year and is coat is very soft and fluffy. Laughing can often be heard from his stable, as his playful nature and loveable personality shine though. Harry and Macaulay have lived at LRAC for a number of years and have worked with our riders and drivers long before we took ownership of them. They are both trusted members of our team and loved by us all.